Former IWGP Heavyweight Champion Kenny Omega has officially signed with All Elite Wrestling (AEW). All Elite Wrestling (AEW) continues to take the professional wrestling world by storm. Earlier today (Thurs. February 7, 2019) AEW held its “Double Or Nothing” Ticket Announcement Party from the MGM Grand in Las Vegas, Nevada. To close out the event, AEW announced its biggest signing yet. Former IWGP Heavyweight Champion Kenny Omega has officially joined the promotion. Following months of speculation regarding where he may end up, Omega has joined his fellow former Bullet Club members, Cody Rhodes and The Young Bucks. 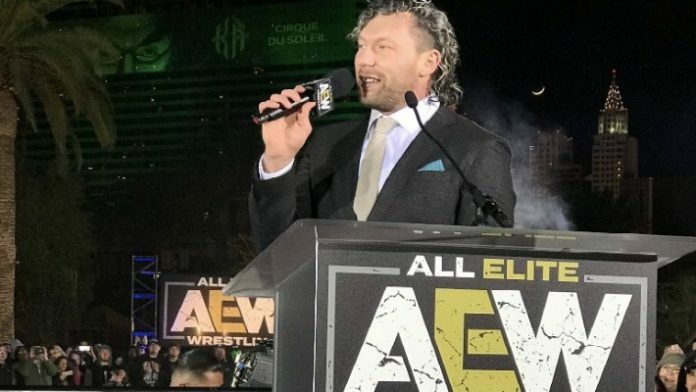 Along with serving as a talent, Omega has also been named an Executive Vice President of AEW. Omega told the Las Vegas crowd that he only put pen to paper this morning. He is now a full-time member of the AEW roster. Omega said he looks forward to finally being able to change the world alongside the cast and crew of AEW. “The Cleaner” was then interrupted by Chris Jericho, who came face-to-face with Omega before attacking him. What do you think about Omega signing with AEW?